← And the winner is. . . I apologize for being away from the blog for so long. The Thanksgiving holiday had me very busy in my kitchen, and all of that is finally starting to wind down enough for me to catch my breath again. I want to regale you with stories of Thanksgiving triumphs and a few blunders, but for now I wanted to share this link with you to my recent interview with India’s Femina Magazine. The talented and inspiring Rajani Mani of Eat Write Think conducted the interview, and I am very flattered that she selected Jacob’s Kitchen to be featured. She asked for me to share a short recipe with them, and I couldn’t think of anything easier or more delicious than my Salted Vanilla Caramel Sauce, which is the perfect thing to have on hand to make any last minute dessert feel really special. Enjoy! Hey Jacob…congratulations on the interview. It was wonderful and you are so talented. I was sorry to see that you were eliminated from the PFB competition….in my humble opinion, you should have won it! I’ve also been away from the blog for several weeks so happy belated Thanksgiving! Thanks Jill! I so appreciate all of your support throughout the competition =) I hope you had a great Thanksgiving! Great interview. Love the sauce…beautiful presentation and I was a follower and a voter on Foodbuzz….You are a very talented young man and I am continuing to enjoy your posts. What a great sauce! And great interview. Congrats on being selected! Thanks for the caramel recipe! Congrats on the interview… seems like you aced it. Congratulations on the interview. That’s quite an accomplishment. You’ve earned it. Congratulations on the interview. I have followed you all the way through the Foodbuzz competition, and I have fallen deeply in love with your recipes. Just the other day I made your white bean tuna salad, but subbed the white beans for black-eyed peas and added one more can of tuna. Great recipe!! I visit you often. What a nice article! You really are lucky to live where you do with so much fresh produce! btw- gf scones I adapted from your recipe were a hit with my kids- well all of us really! Congratulation for the Interview also :)) Well done! Congratulations on the interview. I will try the salted caramel sauce soon. What a wonderful opportunity for you, congratulations on the interview. I liked the way it went…really personal and quite frank! What a great honor for you! The interview is great. I love the caramel sauce on the oranges. It is such a fabulous combination. Jacob — congrats on the interview. Very well deserved. Congrats on the interview!Great job! WOW. Wow Wow! This salted vanilla caramel looks like heaven on earth – and to pour it over some oranges???? You’re killing me over here! I could very easily pout your caramel over some vanilla ice cream, brownies, a cheesecake or straight up. Very lovely and gorgeous photos. This looks delicious! Did you use a white-box to take the photos? No, I didn’t use a light box. Just two white pieces of foam board in front of a window. =) Very unsophisticated around here. Congrats! Lovely interview. And there is nothing better than the smell of sauteing onions and garlic. Caramel sauce? Be still my heart. Will you marry me? Oh, yeah. I’m already happily married. OK, can I adopt you? Great photo, natch. wowoowowow i can’t believe it , I used to read femina quite regularly a while back and congratz on appearing on it , great interview . The caramel sauce looks so silky delicious. Love the idea of it over a simple orange. But amazing over vanilla ice cream. Many Americans aren’t aware that caramel’s roots come from south of the border. After all, dulce le leche is all caramel-y goodness. That part of Mexican cuisine comes from Spain – and oranges like this have Spanish origins as well. 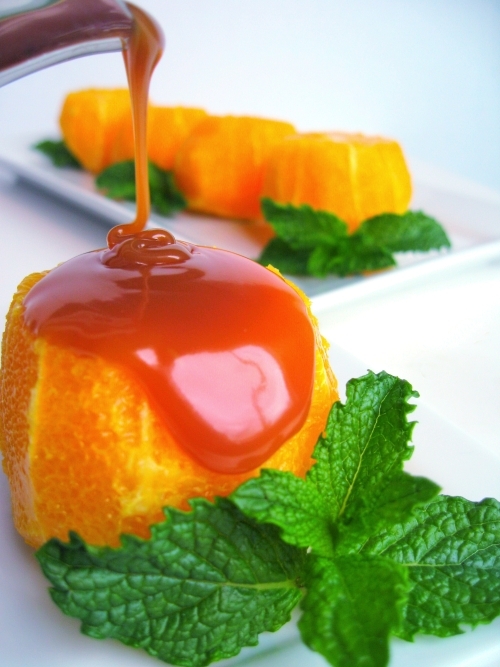 So, the caramel sauce with oranges is a very traditional pairing in a Spanish sort of way. yummy! that looks delicious. thank you so much for sharing all these recipes with us. and congratulations on the interview.